Winter is always tricky when it comes to fashion. While shopping for clothing for cold seasons; you can’t just think about fashion and style, you also need to make sure it’s functional. Ponchos and capes have hit the fashion scene, and they look promising. Both are a great choice for a coat when you need something to keep you warm and elegant at the same time. Check out our opinion on this cozy trend below. After seeing Burberry’s personalized Prorsum poncho on the runway this past fall, we knew ponchos were going be trendy this season. Combine all of your winter essentials, like heavy knits, layering pieces and cozy textiles, into one garment: the poncho. It’s an iconic piece of folk style that layers flawlessly over any winter outfit. Its design also naturally adds a touch of bohemian flair. 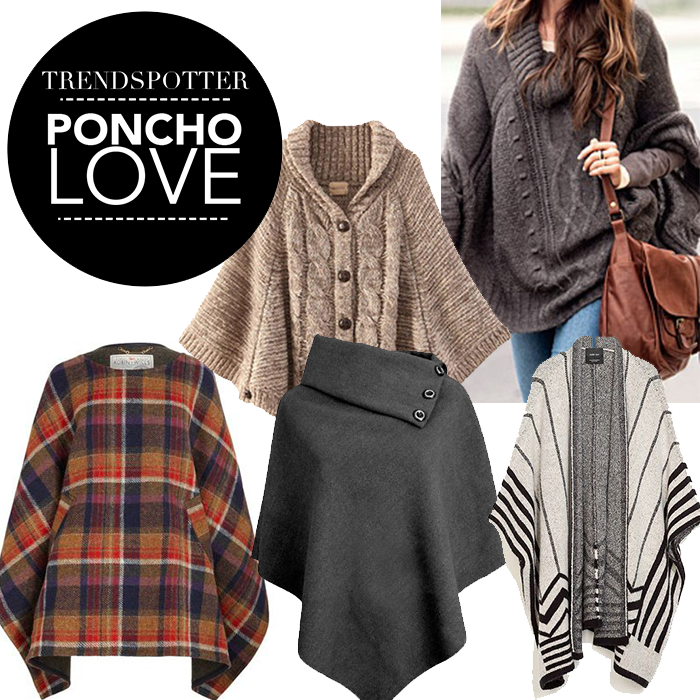 Not only does the poncho look striking over your shoulders, but it’s also very versatile. This coat can be the ideal lightweight piece on a mild day or a sheltering, layering item when the weather calls for bundling up. Depending on the fabric and style of a poncho, they can be worn year round. However, for the winter, look for heavier fabrics like wools and knits, large batwing sleeves, longer styles and even faux fur if you want to be extra cozy. Here are a few of our favorites if you’re looking for inspiration. Because who wouldn’t want to be a superhero of style? The flattering cape trend made its stylish entrance during the fall. By design, it’s very classy and makes quite an impression. It’s hard to go wrong when you’re draped in a classy cape coat, but if you’re having trouble finding the perfect fit, do not fret. There are different styles of capes to choose from. For instance, the Ruana is a loose knit cape. It’s a free-flowing wrap that is open at the front. Sometimes it can seem bulky and overwhelming. To counteract this, stick to a slimmer silhouette on your bottom half and add a bit to help balance your figure. A zip up cape features a zipper (who would have guessed? ), making it very versatile. Pair it with an A-line skirt or tapered pants. Add a structured handbag and your favorite pair of booties for a sophisticated ensemble. Speaking of structured, there’s also the structured cape we need to talk about. The cape provides the structure for your outfit, so feel free to keep your lower half casual. It looks particularly great over slouchy pants like a pair of your favorite boyfriend jeans.